Clicking on any of the fields from the following list will allow you to search for a specific contact that has the attributes you select. You can include whole names and titles or partial spellings in this field. RS10 will produce results that contain the letter combinations that you enter. You can include whole or partial descriptions in this field. RS10 will produce results that contain the letter combinations that you enter. Your contact search results can be further refined to a specific geographic area or individual by using these fields. Words or phrases that may be associated with the contact you are looking for may be entered into this free-text field. Click on Contact Type reveals a drop-down menu that has been configured for your film office’s needs. You can scroll through the list to find the appropriate contact types, or you can begin typing the contact type you wish to include in your search. RS10 will type match your entry whose spelling matches the letters you’ve entered. 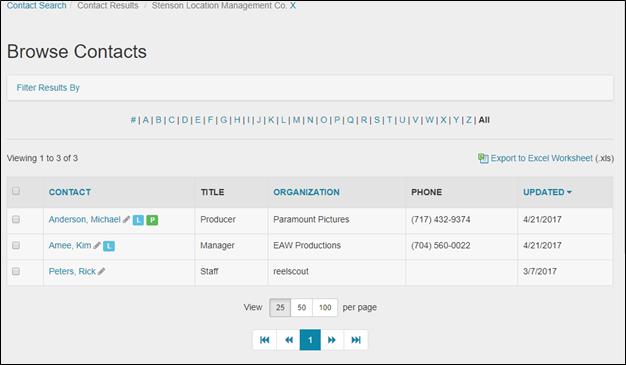 You can also search for contacts that belong to one of the groups configured for your film office. The Group drop-down menu is a single-select field. Click on Group and select the group you wish to include in your search. You can only select one group per unique search. The Last Modified By and Created By fields allow you to search for contacts that have been entered or edited by a film office staff member. The staff member may be selected from a drop-down menu. The From and To boxes are date range fields. When you select these boxes, a calendar will appear that you can use to select the appropriate values. Alternatively, you can type in the date as MM/DD/YYYY. You can further refine your search results by choosing to display only Active Contacts or Inactive Contacts. If you wish to view all of the contacts that match your search criteria, leave the Active selection in the default setting of All. Additionally, you can use the Sort buttons to select how you want your search results to be ordered. After entering all of your search criteria, click the Search button at the bottom of the Search Contacts page. You will be taken to the Browse Contacts page, where all of the search results returned will meet each of the criteria you have selected.